Roman shades are expensive, and I need more than 3, so I figured why not give it a go... it worked flawlessly! A bonus.. each shade cost me less than $10!!!! So, after a week of looking at my new roman shades, I decided they needed a little pizazz. 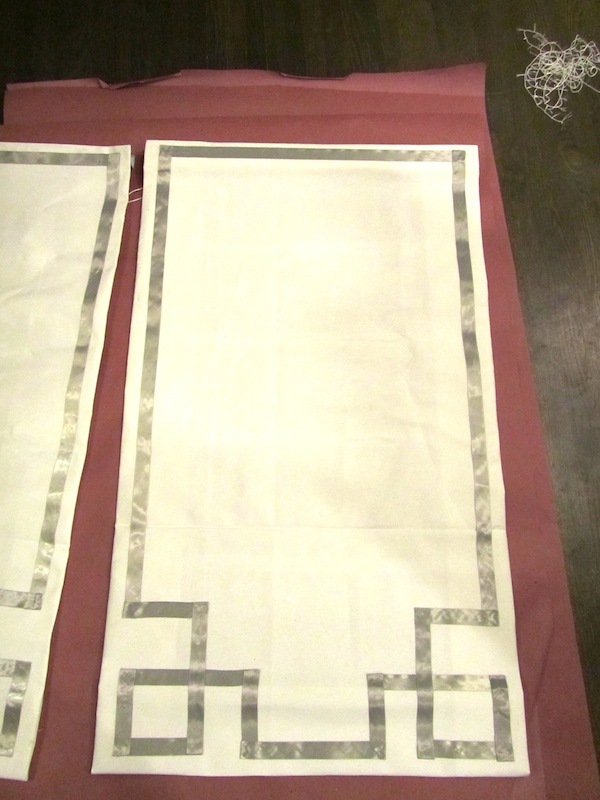 If you follow Jenny's DIY on making the shade, below I will show you how to add a detailed border! *she advises not to use hot glue, but after I made the first one with fabritac and it stained through the fabric and ribbon when dry, I decided on using hot glue, and it worked much better for me. please excuse the bad photography.. I started this project at 10 p.m. not ideal for taking photos. 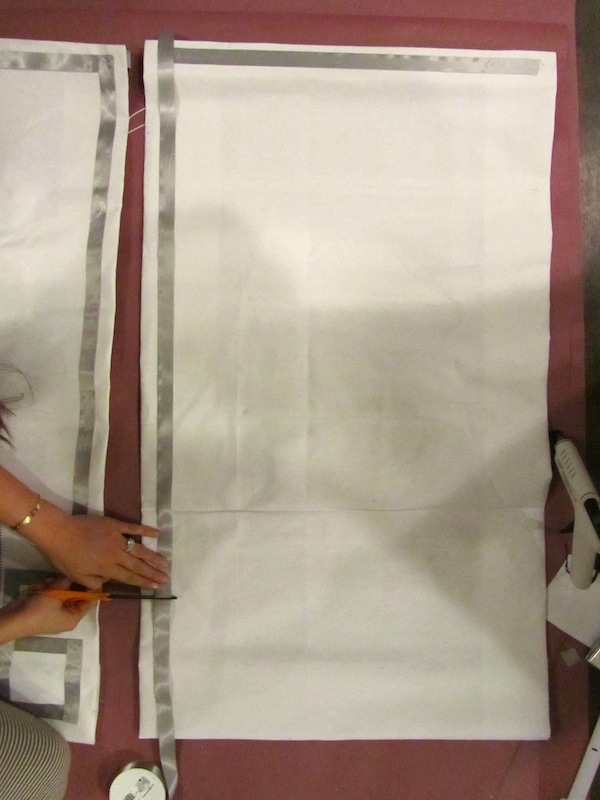 Cut the ribbon of your choice into a long strip across the top of your shade, and leave the edges blunt. I left about a 1/2 inch border on mine. Glue that ribbon into place. Cut a piece of ribbon that is slightly longer and 3/4 of the length of your shade. You need a slight excess to create a fold-over on one end. On the end "top" end that you will glue over the existing strip of ribbon at the top, fold over the ribbon, apply a little glue, and seal it together. Make sure that your fold doesn't make your ribbon too short or too long. Glue the end of ribbon that you have created the fold on to the top of the first ribbon you glued down, if you are using hot glue glue sections of the ribbon down until you have glue it all the way down. Follow this step on both sides of the shade. I realized that I missed the photo of this step, you will need to cut 4 pieces of ribbon that are each about 1/4 of the width of the shade. Set aside two pieces to be used in step 8, For the other two pieces, on one end of each piece, create a fold this should make your ribbon slightly smaller than 1/4 of the width of the shade long Glue the folded end of the ribbon over top of the ribbon you glue down in step 3 going horizontally toward the inside of the shade. Follow this step for both sides. Lay a piece of ribbon out lining up over the end of the ribbon you glued down in step 4, and going to the end of your shade [or where you want the pattern to end]. Cut the ribbon to the appropriate length. Create a fold at the top of that piece of ribbon and ONLY glue the fold onto the ribbon you glued down in step 4. DO NOT glue the entire ribbon down. Follow this step for both sides. Line you ribbon up next to the ribbon piece you glued in step 5, and cut it slightly shorter than the ribbon in step 5. You do not need to create any folds on this piece of ribbon. Follow this step for both sides. Taking the ribbon piece you cut in step 6, line it up UNDERNEATH the ribbon from step 5, halfway down. Holding the ribbon in place, move away the ribbon in step 5, and glue this ribbon in place. Follow this step on both sides. 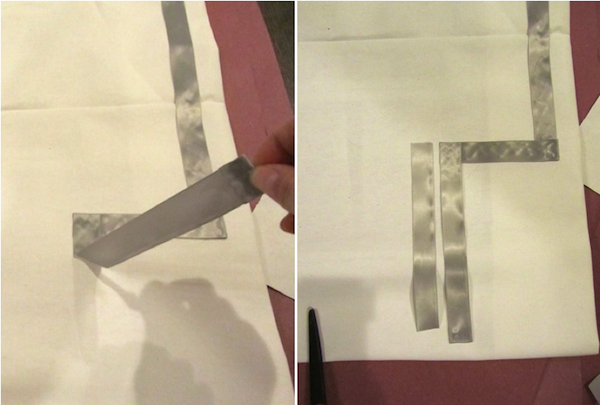 Using the two blunt pieces of ribbon you cut in step 4, line one piece up horizontally directed underneath of the ribbon in step 5. Glue it into place. Follow this step on both sides. Finally! Glue the ribbon from step 5 fully into place. Follow this step on both sides. Cut 4 pieces of ribbon that are slightly longer than half the length of the ribbon you glued down in step 9. Set 2 pieces aside, on the remaining 2 you need to create folds on both ends of this ribbon, be sure not to make you ribbon the correct length while creating the folds. Once you have finished the folds, glue this ribbon into place on the far side of the "square". Follow this step on both sides. With the two pieces you set aside in step 10, take them and create folds on one end. Make sure that with folds these pieces line up, and also end at the bottom of the "square" you finished in step 10. Glue the piece of ribbon over the end of the piece of ribbon you glued down in step 7. Follow this step on both sides. Cut a piece of ribbon that spans the bottom of the shade between the pieces you glued down in step 11. Make it slightly longer, and create folds on each end. 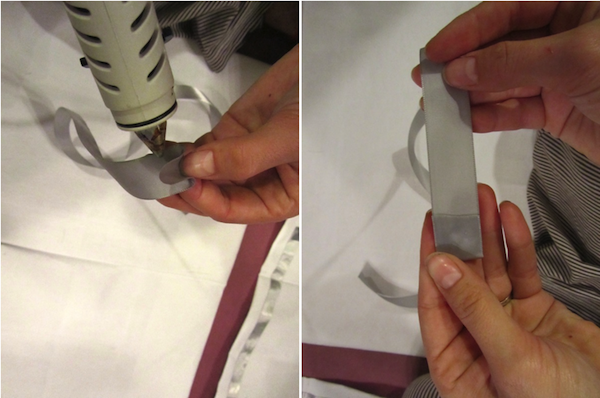 Once folds are created, glue it into place horizontally over the ribbons in step 11. When you're finished, it should look like this!!! OMG it looks amazingggg! 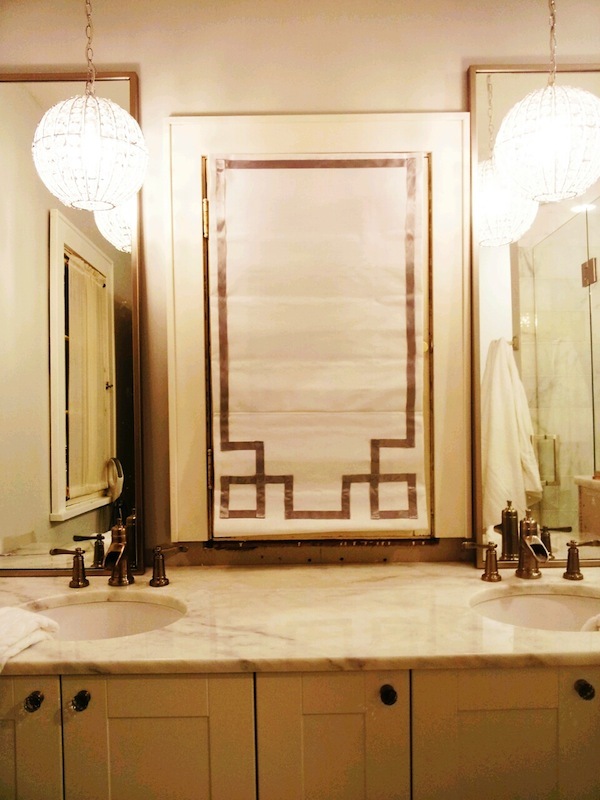 I need to do this for my romans for my bathroom! Thank you for the tutorial! amazing DIY! they turned out so great! Woah! What an amazing DIY! These seriously look flawless + extremely expensive! So exciting....this is just heart touching. look so good. NEONS : FIND THEM AT THE MALL!